Machine quilting takes practice, but it's much faster than hand quilting and I love the look when it's finished. It's probably a good idea to make some 12 inch "quilt sandwich" squares of batting in between two layers of muslin and practice quilting those first. And also, know that it takes time and practice to develop this skill. Your quilting will improve with each quilt. There are several things you need to do to get your machine ready to machine quilt. You need a darning or free motion quilting foot. The special thing about this foot is that it goes up and down with the needle while you are sewing. This makes it so you can move the quilt any way you want while you are quilting it. Lower the feed dogs on your machine. I have read that if your feed dogs don't go down, you can tape an index card over them. I haven't tried that though. You don't want the feed dogs telling your fabric which way to go; you are going to be moving it with your hands. If your machine has adjustable presser foot pressure, you probably need to adjust it so there is space under the presser foot when the lever for the foot is in the down position. You have to have the presser foot in the down position in order to have top thread tension; if you don't have top thread tension, you can't sew. This picture shows the little black dial to adjust the presser foot pressure on my old Viking machine. Your machine may not have adjustable presser foot pressure; one of my sewing machines does not. I can still machine quilt with that machine because it has a quilting foot that goes up and down with the needle while I sew. I'm sure there are other types of machines and setups for machine quilting, but I only have experience quilting with two types of sewing machines. Whatever you need to do to get ready to machine quilt, you need to have your presser foot go up and down with the needle when you sew. And finally, don't forget to change to a new needle. They actually make machine quilting needles, which I have used, but I haven't noticed a difference between those and regular universal needles. Get some machine quilting gloves or other gripping device. I got my gloves at a local quilt shop, and I like them. They have plasticky gripper dots on the fingers and palms and make it much easier to move the fabric around while I'm quilting. There are also other options for helping you get some grip on your palms and fingers and you can find them if you do a search for quilting notions or quilting gloves. If your sewing machine has a table extension thing, use it. If your machine fits into a cabinet and you have a flat surface, that's even better. Next you need to get your quilt ready to fit on the machine. This is a baby quilt that's about 36"x42". It's not that difficult to quilt, but bigger quilts require more wrangling and patience. For a baby quilt, I quilt half of it, lengthwise, at a time. First, roll one side in to the halfway point; this side will be to the left of my needle. Then, roll the other side in a little bit, leaving 5-6" or so unrolled in the middle. Next, take the quilt and accordion-fold it from the bottom. The folded part will be placed in your lap and you will start quilting at the top. First, position the quilt, lower the presser foot, and then using the hand wheel (is that what it's called?) take one stitch and pull the bobbin thread to the top. Make sure the needle is right above where the bobbin thread comes up, and sew 3-4 stitches in one place. This anchors the threads and then, ta da! You are ready to quilt. You will need to pull the bobbin thread up like this each time you start stitching. My son, who is 7, took this picture. It is supposed to show my hand position when I'm starting quilting. It's not the best angle to actually show that, sorry. I quilted over to the right side of the quilt, unrolling it a bit as I went. When I went back to the left, I had to roll up the right side of the quilt again. I ran out of bobbin thread so I decided to take a picture and show you how it looks so far. You might want to make sure you have a full bobbin, or two or three, before you start. When you stop quilting (on purpose that is, not when you run out of bobbin in the middle) you need to sew 3-4 stitches very close together to keep your quilting line from coming undone. When my bobbin runs out, I just start sewing about 1/2" before the spot where my bobbin ran out, and sew right on top of those last few stitches. In this picture, I'm getting close to the bottom of the quilt. I find it helps control the motion of the quilt if I fold the top of the quilt under as I get closer to the bottom. This is the quilt with the first half of the quilting finished. This is the back of the quilt, showing a little closer up view of the unquilted and quilted areas. After you finish quilting the first side of the quilt, you will need to lay it out again, and roll up the already quilted side so you can quilt the other side. Try to make the second section of quilting blend in with the first section. This shows the quilting all finished. Here is a closer view of the quilting from the back. And, a little discussion about the meandering style of quilting that I used on this quilt. Meandering is a kind of curvy quilting that typically has smooth curves, no sharp (or blunt, I guess) corners, and lines that don't cross over each other. If you look closely at this quilt you might see some loops in my quilting; I got stuck and had no other choice. Plus, there are no quilting police. Also in meandering, you should try to keep the distances between quilting lines relatively even. When you are practicing, I'd suggest trying meandering, in different sizes (when it's smaller it's called stippling). You could also try writing your name, drawing pictures, making loops, or whatever you want. You just want to get used to the feel of moving the quilt with your hands while you're pushing the pedal with your foot. Which brings me to stitch length: there are long arm machines and Berninas with stitch regulators that help keep your quilting stitches a uniform length. If you're just quilting on a regular machine, you'll need to be your own regulator. You don't want to have stitches that are overly long or too short. You'll need to experiment to see what stitch length works for you. You might want to try going faster (via the foot pedal) than you think is necessary and then figure out the right speed to move the fabric with your hands. Let me know if you have any questions or if you have some quilting you want to show off! When I machine quilt, I start in the middle section and usually go left to right in a section about 8-10 inches wide, and then go back and forth while I'm moving down the quilt. Then when I get to the bottom, I clip threads, re-roll the quilt, and start again on one of the sides (or slightly over from the middle, if it's bigger than a baby quilt). I love your tutorial...I still have big problems with free motion...maybe because it's called free? Great tutorial. I just finished one of my first quilts, and the machine quilting was scary. I made a lot of mistakes, but I'm proud of myself because I tackled one, and am ready to try another one. Great blog. I learned a lot from your tutorials. Thanks! You've taken great care to illustrate as you demonstrate. Very helpful. I love it that you appear to use "just" a sewing machine, not a $7,000 machine quilter. (I fear I wouldn't live long enough to get my per-quilt costs below $1-thousand each. )I'll be back for more as I learn to use meandering as I machine quilt. Getting ready to do my first free motion quilt. Your tutorial was very helpful! Thank you for posting this - so elpful as I am about to quilt my first free motion quilt, as a gift for my niece. I think I'll practice on some scrap fabric first, thanks! Thanks for the pictures! Yours is the first explanation that has made any sense. I have a table runner to quilt and now I have a clue about how to do it! great pictures! i just finished my first machine quilt (stitch in the ditch style) and now i am ready to tackle free motion! One question - how do you avoid puckering? My first quilt had horrible puckering on the back. thanks! I think I have the same machine that you are using in your photos, or one that is similar. Is it a Viking Classica 105? When I took a quilting class the instructor told me that my machine would not do free motion so I never really tried. I have done straight stitch quilting with my machine using a walking foot with success, but really want more flexibility. Thank you for posting your tutorial. Anonymous--my machine in this post is a Viking Classica 100 and I was told at a repair shop a few years ago that it is from 1983-1986. It has a presser foot adjustment dial on the left hand side of the machine. I just adjust this dial to it's lowest setting. I can take a picture of it if you want. If you could, that would be great! Thanks. Thank you so much for the tutorial. It's very informative. This may be a naive question...does the batting loft make a difference when free motion quilting?? the presser foot adjustment dial is shown in the second photo from the top in this post. Batting loft does make a difference. One thing you could do (this was encouraged in the machine quilting class I took) is make some small quilt sandwiches with different types of batting and quilt on them to see how they quilt up. Tension--ADawson, sounds like your bobbin tension is loose. You could figure out how to adjust it yourself (usually it is done via a small screw in the bobbin case) or take your machine into a repair shop and see if they can help you. I hope you can figure it out! I have had so many problems with loops on the back of whatever I was quilting, that I haven't machine quilted anything for 3 or 4 years. I decided today I would try again. Loops and more loops!! Searched the web for info as I was determined to do this. Nothing helped. Until I came to your blog. Presser foot must be down in order to have upper tension. I had not come across that hint anywhere else. Loops are 95% cleared up. I will play with my tension and hopefully that will fix it. A million Thank yous!!!! You're welcome! I also am learning that it's ok, and not scary, to adjust your top thread tension. Tighter tension will keep the top thread from looping to the back. Just make a note of "normal" tension before you change it. I wonder if I could talk to you about your Viking Classica 100 machine. I just bought one at an estate sale and it didn't come with any accessories. I'd love to find out what feet you use most often,etc so I can hunt them down at my local fabric store. I plan to machine piece, maybe quilt (I"m a newbie) and sew some simple clothing. Thank you so much for such a detailed explanation. Can't wait to try it. Outstanding tutorial. I just did one and know how much work goes into making one. 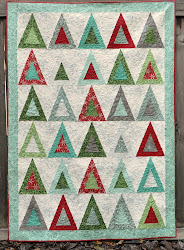 I've just started to FMQ and I love it, but I need to practice and then practice some more. You have given me inspiration and made it much clearer for me. Thank you so much. Your photographer did a great job! Thank you for your tutorial, you are the only person I have watched that mentions the pressure foot tension, and I like another viewier was having issues with looping on the back and could not figure out my problem! No, there is no quilting police -- just vigilante justice in the quilting community! ;-) Thanks for posting this. I'm learning FMQ right now and hunting down tips, suggestions and tutorials online and it's amazing how they all contradict one another! But the picture of your hand position when you're starting to quilt was helpful to me. I think I was trying to do it with my hands too far apart and that's why I didn't have as much control. Great tutorial! I'm still a newbie at FMQ & I find it difficult to carve out time to practice but I know I just have to pull up my big girl pants & do it! Have you tried rolling quilts for quilting on a regular sewing machine that are larger than a baby quilt? I've tried but haven't had much luck and end up quitting and wasting the fabric. Thanks. Anon--yes, I've quilted many quilts larger than baby size on my regular machine. Sometimes it can be tough to get into the middle, but it's possible. Maybe try a throw-size quilt, for me those are usually about 50" wide and aren't too difficult to quilt. Always, always make sure the presser foot is down. Even when it looks like it is not touching the material. That causes most of the eyelashes or loops people complain about on the back of their quilts. Sometimes it looks like it is down but it is not. I have a middle of the road Janome and, per instructions from Missouri Quilt Company, turn my top tension to "9", drop my feed dogs, make sure my presser foot is down and GO! Remember to always thread your machine with the pressure foot up and the needle in the highest position. That eliminated the loose thread problem for me.